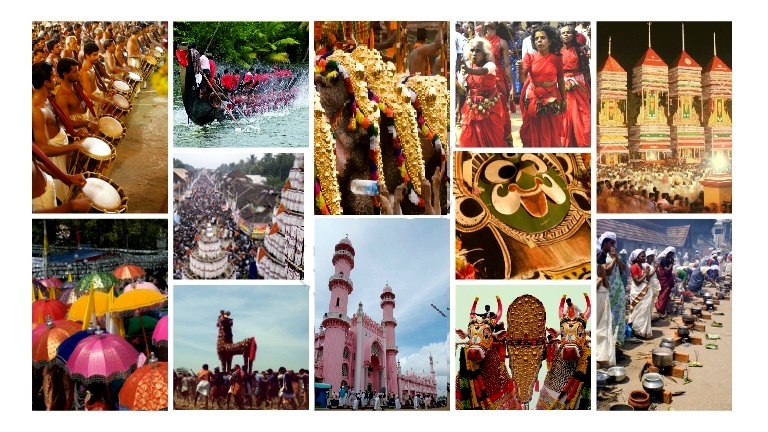 To experience the festivals of Kerala is to experience her joie de vivre, her energy, her vivacity and her sparkle. There are many festivals that manifest the communal and social unity of the people. Most of the acclaimed art forms of the land have developed, evolved and grown in stature, primarily through their association with festivals over the years. While many of the festivals are associated with places of worship, secular festivals also abound. Onam is the State festival of Kerala. Among the religious festivals, Vishu, Navaratri, Deepavali, Shivaratri, and Thiruvathira are the main Hindu festivals. Ramzan, Bakrid, Muharram and Milad-e-Sharief are the important festivals observed or celebrated by the Muslims, while Christmas and Easter are the major ones for the Christians of the land. Apart from this, a number of small, distinctive festivals are celebrated at places of worship of all the three communities.